The weather has been unbearably hot in the high 90's this week so what better way to get into the summer spirit by cooking up some delicious ribs. I. LOVE. RIBS. Douse them in BBQ sauce and I am a happy gal. Usually Hubs is the one cooking them up on the grill but since I am a huge fan of the crock pot, I decided to make them myself. These are the easiest ribs to make and they fall right off the bone. What more can you ask for? Pair it with some cole slaw and onions rings and it's just heaven in your mouth. 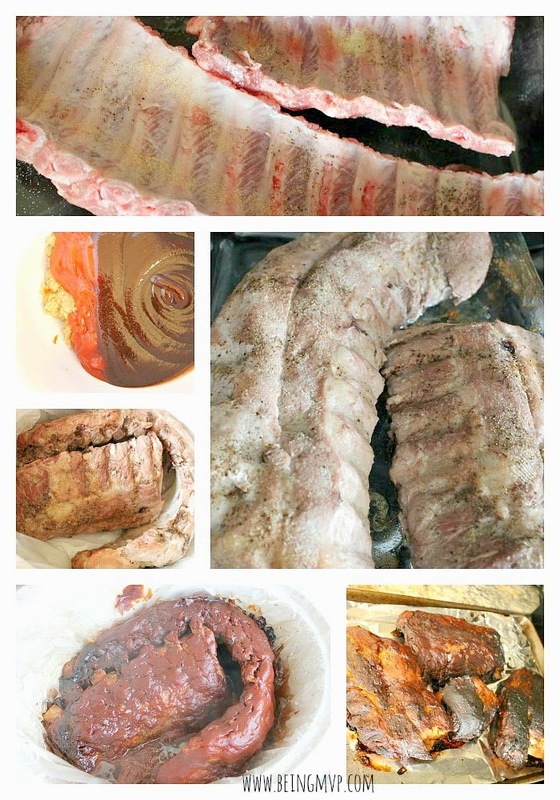 Place ribs in baking dish and season with salt, pepper, garlic and onion powder. Bake for 15 minutes and then turn over and bake for 15 more minutes. In a small bowl combine BBQ sauce, ketchup and brown sugar. Place ribs in a large Crock Pot (or slow cooker). You can also use a liner if you want like I did for less mess. You can either cut or curl the ribs. Pour the sauce on top and cook on low for 6-8 hours. If you want to caramelize the sauce, put the ribs back into the oven for 15 minutes at 400 degrees. Do you use the Crock Pot to cook? What are some of your favorite recipes? These look amazing! 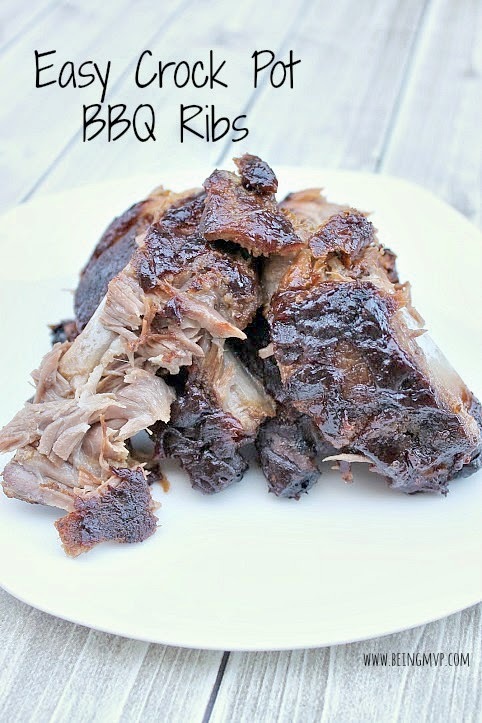 My husband loves ribs, I may have to make these for his birthday! Oh they look delicious! I have made in the crock pot many times and they turn out great. Your recipe sounds wonderful! My entire family loves to eat ribs. These sound delicious and I love that they are made in a crock pot. crock pot ribs are the best! the meat is so tender and falls right off the bone. It is the best! We use K.C. masterpiece BBQ sauce. These look wonderful, I'm always looking for crock pot recipes to add to my collection. Question: shouldn't the liquid levels cover the meat? These sound like something my husband would love, thank you for shairng with us! My daughter has been asking for ribs, never tried making but this looks easy! These look so delicious! I'm dying to try out this recipe, I never thought you could make it in a slow cooker. This looks amazing! We love using the Slow Cooker at my house. We make Pulled Pork sandwiches and Crockpot Barbecue Chicken! 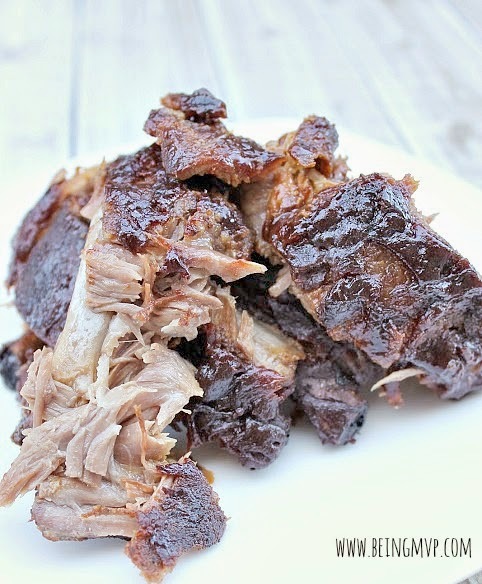 Pork Ribs are a favorite in my household but I've never made them in a crock pot before. I'm pinning this recipe for future reference! I am going to have to try these, I can never get ribs done right. I make all kinds of meals in the crock pot, pot roast is always perfect in there. I always think of ribs on the grill but this sounds much easier! These sound so good. Thank you for sharing your recipe with us. This looks so delicious and easy, there aren't that many ingredients and no complicated steps. Bookmarked! I have never made ribs before in my life. I have always been afraid that I would end up with rubber tires on bones. But these look so tender and juicy that I am going to take the plunge. Also loving that it is done is a crock pot! To be honest Im always intimidated by cooking ribs!! But this sounds easy!! yay for the crock pot!! I may give this a whirl the next time they are on sale! !